Love Green Day and especially for running. I had a thing for Robert Smith of the Cure for a looong time, so I can understand! We are planning to go on Monday night. My husband loves them! I like the music just not sure what to expect with the crowd.... and I am totally stumped on what to wear. 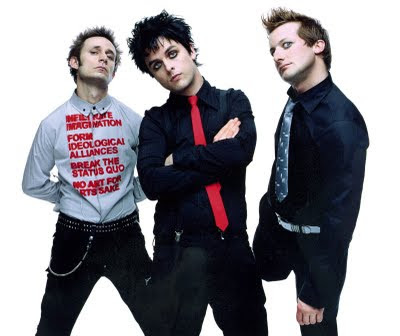 I love Green Day! So jealous that you are going to their concert! No one can rock the eyeliner like Billie Joe. Have fun! Have fun at the concert! My SIL just saw them and said they were awesome! Miss Madras - there are always the crazy kids down on the floor going nuts, but if you're up in the seats, you'll be fine. I always see young kids there, but it's totally not a show I'd take kids too. Lots and lots of F-bombs dropped and whatnot - just inappropriate stuff for young kids. They put on an amazing show though! Last night was no exception. Oh, you are NUTS!! Billie Joe and Bob....holy heck!! But I am loving their new album. I'm sure the concert will be awesome!